☆Light and portable with built in carrying handle, equipped with "Twist open" opening mechanism. ▲BPA-free Leak-proof Water Bottle--Be made of non-toxic BPA-free leak-proof plastic, with a tough carry-nylon rope. It is very convenient to carry. 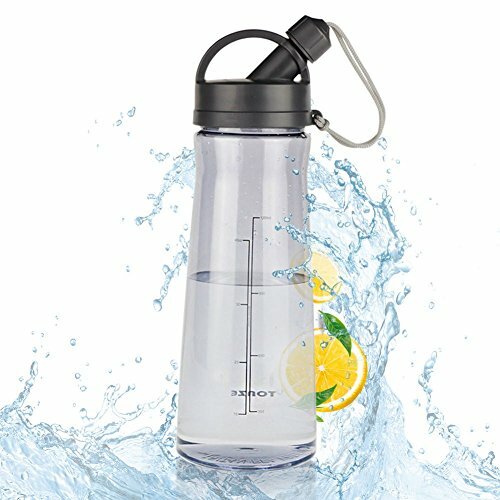 ▲Great Design--A special reflective casing can Transparent or see through bottle, it is also designed with leak proof lid and narrow mouth to reduce spills and sloshing when you drink. Lock Secure Push Button Lid With Rubber Gasket To Prevent Leaking! There also have wide mouth for easy access for ice and cleaning. ▲Idea for Anywhere Use--The plastic water bottles is suitable for all general exercise and fitness activities indoors or outdoors keeping you hydrated throughout, or simply to stay hydrated at home or in work bodybuilding, weight loss, camping, traveling, exercise. ▲Perfect for All Ages--Light and portable with built in carrying handle, equipped with "Twist open" opening mechanism. tough carry-nylon rope prevents falling. Perfect for everyone --adults and kids. Great gift that will make your beloved ones happy and healthy! ▲Quality Guarantee--If for any reason our product doesn't meet your expectations, welcome feel free to contact on us, we will give a great support.